I recently read an article that attempted - awkwardly and unsuccessfully - to promote "body acceptance". After some reflection, I think maybe the article itself wasn't the problem; my outlook is. You see, there's a fine line between accepting your body and ignoring it. Or maybe I should say "neglecting" it. After a drastic rise in eating disorders in the 90s and early 2000s, partly (and superficially) blamed on the "heroin chic" look of models, we've finally come to a point when young women are encouraged to accept their bodies and treat them well. This is the kind of body acceptance I can happily get behind. And of course I'm delighted and supportive of this. Like many women - hell, like many human beings - eating disorders have touched my life in many ways. I don't write this with flippancy, and I don't take the issue lightly either. But I am uncomfortable with the fact that suddenly any encouragement of healthy lifestyles seems to fall into one end of the spectrum or the other. We see women and men forcing themselves to exercise beyond what is necessary or deemed healthy; we also see them turning their back on any kind of self-improvement and hiding behind "body acceptance". Should we accept our bodies? That shouldn't even be a question. Our bodies are fascinating machines; they work in ways that, to me, sometimes seem almost magical. It's mind-blowing to know the details of how our systems work to moderate our breathing, our temperature, our blood-flow, our energy...How can anyone look at the trillions of cells working in harmony to create a human body not find it miraculous? Nature and its inner workings never fail to leave me awe-struck. Our bodies are capable of amazing things. Running has taught me that. History has taught me that. We are physically able to do so much, and we are only here living our lives because we have a body to live in. Our bodies deserve to be treated well, taken care of, and respected. This means our bodies deserve exercise. So why do I feel so uncomfortable with "body acceptance"? 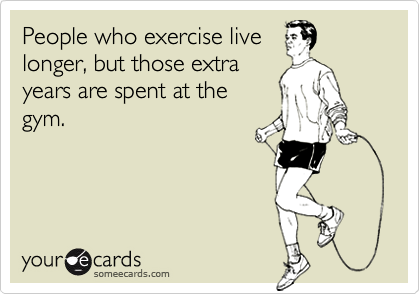 It's probably because these days that seems to be a euphemism for avoiding exercise. More and more I'm seeing this weird battle about what makes a woman a "real" woman. It started as a way to empower those that didn't fit the ideal, which is something like 95% of us. But it's become an "us vs. them" mentality. To hear the rhetoric, either you're thin, fit, and smug about it, or you're overweight, sassy, and proud. Exactly. Whatever floats your boat, ladies and gentlemen. Fat-shaming and prejudice is despicable, whether a person is fat due to simple inactivity and overeating or a glandular disorder. I believe in loving our bodies as they are; I also believe in self-improvement. I believe in pushing yourself to see what you can really be. I believe in testing the paradigms we surround ourselves with in order to test and realign our world-view and our idea of "normal". Why is this a desirable mindset? There has to be a balance between accepting our bodies, loving our bodies, and improving our bodies. This is the same reason I feel uncomfortable when people talk about exercise as a form of bodily punishment, as if their body is a disappointment or a wayward animal that needs to be brought to heel. Exercise has taught me to love and accept my body, not because it has changed my body, but because it has changed my mind. I'm afraid I've written this whole thing and have no answers for myself. How do we balance body acceptance and improvement? How do we seek to "fix" ourselves while still loving ourselves? Why does "body acceptance" have to mean neglecting making healthy exercise and food choices? I don't think it should. And because I believe in staying positive, and I need to remind myself that not everyone out there has such a skewed outlook on health and what bodies "should" look like, here are links to two excellent articles about bodies and weight. What does "body acceptance" mean to you? What are your thoughts on finding balance? I'm on the same page. I'd love to have a visible 6 pack, but I'm not willing to cut out all sugar, dairy, and most carbs for my entire life. That doesn't seem sustainable. Knowing my core is strong is enough, even if it looks soft to an outsider! The definition of body acceptance for me has two parts: 1.) Being comfortable with my body in its varying states, while striving to be healthy. 2.) Not being judgmental of others and their preferences for their bodies. 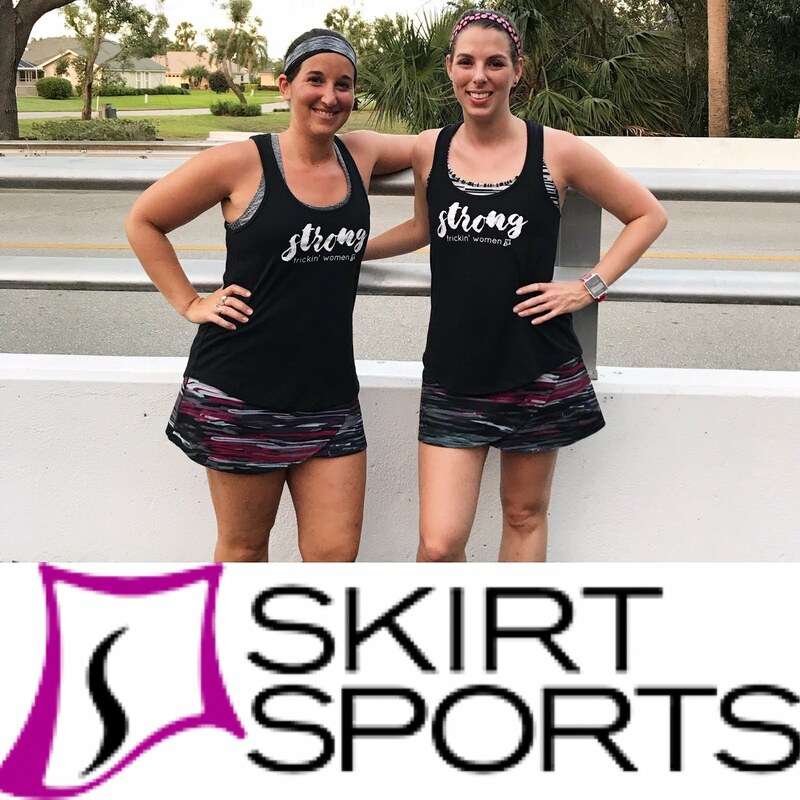 In my own experience finding balance with exercise came about when I started thinking of it as more than just a means to an end (losing weight/maintaining a specific weight). Once my exercise goals went from "lose 15lbs" and "must workout 2 hours a day" to "run a half marathon" or "run because it makes you feel good" there was a fundamental shift in my entire way of thinking about exercise and body acceptance. Even though I know my body isn't at its healthiest weight and there is work to be done, I've also never felt more comfortable in my own skin because THIS body is helping me achieve some goals that I never thought I would. This is so moving, Kristina. You're right, a shift in perspective and in our relationship with exercise often changes how we then feel about the exercise in turn. And then, because we can accomplish great things, we appreciate the body that gets us there, no matter what it might look like. And yes, you hit the nail on the head with the note on judgment. It's hard because it seems judgment comes from all sides now; apparently no one is safe from it, which makes accepting ourselves even harder. I know I shouldn't care if people choose to exercise or live a healthy lifestyle, and for the most part I don't, unless I feel they're judging those of us who do attempt to exercise, which is what I've seen in the "body acceptance" movement. It's almost like those who believe in body acceptance also believe that trying to improve ourselves or be healthy is undermining that acceptance itself, which is where my frustration comes in. Thanks for helping me wrap my head around it; I feel like I had trouble putting it into words! You deserve a standing ovation. This is exactly the way I feel. I wish I could type out a long, philosophical response, but my brain is mush. I love, love, love you and your blog. I agree with so much of what you have said here! I hate all the "Strong is the new skinny" BS that's out there. Mostly, I think women, no matter what they look like, are always comparing themselves to other women. You're right in saying to just accept your body, LOVE it and treat it right! Great piece! Yes, exactly! Treat it well, and be aware that it's YOUR body, no one else's! This was a very thought provoking post. I totally agree that body acceptance should not translate to poor choices. I think body acceptance is loving yourself for how you look as well as loving and being proud of your actions which include your health and wellbeing activities. I love the idea of being proud of your healthy choices; I do think it's important to take pride in the positive progress we make! This is my first time reading your blog and I love this post! I find I have struggled with body acceptance most of my life, and it's not easy! I honestly feel that that only time I accept my body is when I'm exercising or racing. I think it's because at those times I feel strong and confident and I'm not worried about what might not 'look right' or why I don't look at perfect as the girl next to me. In my opinion, I think a huge part of body acceptance is NOT comparing yourself to other women. Women should empower each other, not bash each other... I am finally at a point in my life where I am understanding all of this. Thanks again for sharing such an important topic. I'm so glad you found my blog, and enjoyed this post! You're right, I too feel so accepting of my body while in the midst of challenging exercise. I know I've served it well, and it's serving me, too. Great post! This is definitely something I have thought about. The middle ground takes some work to find. I hate that I'm annoyed with myself for having soft abs and skin hanging over my bikini. I sometimes have to work to stop thinking about that and be proud of my healthy habits and my healthy state. I'm sure there are many more people who don't necessarily "accept" their bodies despite the relatively healthy exterior. On the other side, I know many people who are almost judgmental about my healthier choices. I literally have had people [friends, family, strangers] say to me "But you're skinny, so why do you need to go to the gym or eat healthy?" This, to me, is beyond neglecting being healthy. It is having a distain for healthy--probably because of what it means to them, that "ideal" state. Maybe what it comes down to is the definition of healthy. Healthy is sometimes so narrowly focused on skinny or the ideal body type. In reality, healthy has a much broader definition. If we could focus the conversation back to the broader definition of healthy, perhaps the two groups (the self-criticizers and the self-negligent) would be more willing to work toward that middle ground instead of finding themselves battling at that opposite ends of the "health spectrum." Yeah, I've definitely heard the judgment from people who aren't working out themselves; it's almost like my dedication to being healthy offends them. And it's so true that you can be "skinny" but totally unhealthy, or "fat" and in really great health! Looks are deceiving. I don't think we will get anywhere if we put down a certain body type to make a different body type be better. 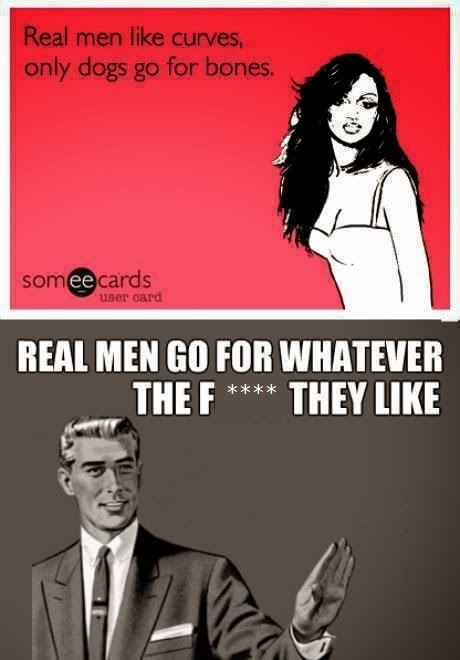 My case in point is the meme you show above that reads "Real men like curves, only dogs go for bones." So in an article of body acceptance someone who is thin is just put down to a dog's liking? That is not right. We need to stop with the put downs --all of them. 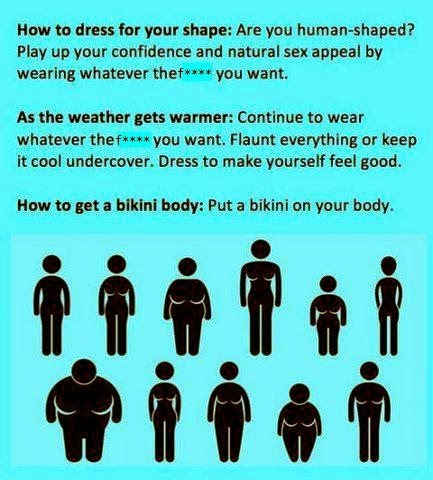 Be confident, ladies, whatever your body type. Desire to be healthy and not a "certain size". I agree that putting down other body types, whatever they are, is totally wrong. That's why I posted the meme...you'll notice the response to it is in support of appreciating ALL body types, not just curvy. I think we see a fear in thin people to speak up about this kind of body-shaming, because their bodies are "desirable" according to society, but we're starting to see backlash there. Health trumps weight everyday; I totally agree. This is a wonderful post Ali. I totally agree with you. You know, I accept my children no matter what. But a big part of that is also taking care of them. Or maybe care-taking is moving beyond acceptance into something even greater and more pro-active. For those of us who are parents, perhaps we should love and care for ourselves with the love and care that comes often more easily for our children. I hadn't thought of care-taking as a higher level of acceptance...like, because I accept my body, I will treat it right. I love that! Thanks for commenting!